Home LifestyleHouse	What kind of Stair Runner Should I Choose? As you may or may not know, we bought a house in November. We have big plans to spruce it up but with the holidays and broken bones and pregnancy, not a whole lot has changed since we moved in. Actually, a lot HAS changed, just not the pretty stuff. One example is the set of stairs up to the bedrooms. 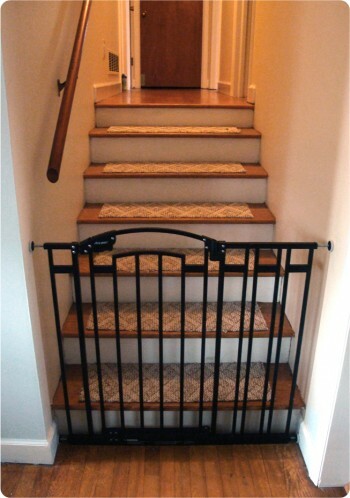 Because we have an old dog and a young baby, these pretty wood stairs just aren’t cutting it. In fact, Krusty slipped on them our first day in the house, so we bought a carpet remnant and some double-sided tape to provide this temporary solution. As you can see, the edges are raw and fraying and each strip is a different size. Now that we are back in the swing of working on the house, we need to decide what direction we want to go. As far as I can tell, we have three options. This would be a rug that starts at the bottom of the steps and climbs each one to the very top and continues for the length of the hallway. We would leave some wood exposed on either side of the runner. I love the idea of this but the challenge is finding a rug that will blend with the living room and stand the test of time, not to mention many trips to the bathroom. This would be just like the runner mentioned above. 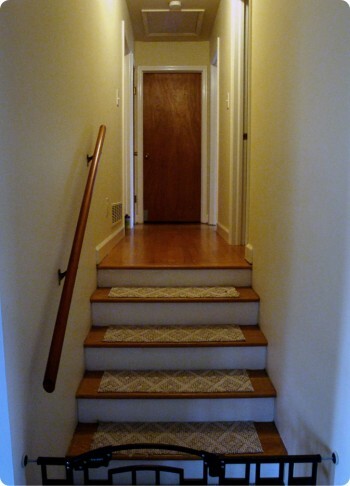 However, instead of running the length of the hallway, it would stop at the top step. This option would be cheaper, but I am not sure how it would look. We would also still have the issue of matching to deal with. The third option we came up with is something permanent that is similar to our temporary solution. The problem here is that we don’t know of anything like that. There are stair pads with grips on the bottom but in my experience, once they get a little dusty, they are just as slippery as the naked steps. So what do you think? Is there a forth and golden option? What would YOU do? We have a full runner going up to the third floor and a partial on the second. I like them both. We solved the matching problem by using a small area rug. I heart decorating! I’ll have to do a post about the re-design of our formal dinning room in homage to a place in New Orleans we love. What’s wrong with the double-sided tape solution?! My thinking is a bit unconventional, but have you considered paint? There’s a Martha recipe for <a href="http://www.marthastewart.com/article/no-slip-steps"adding fine sand to paint to give it texture and a slip-free surface. I realize that the treads are wood so you might not want to cover them with paint, but you might also consider just adding some stripes of paint or painting the same amount as the stair pads you are currently using or painting a “runner”. 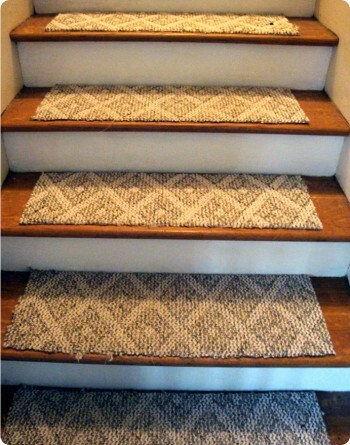 This would give you a clean, slip-free, non-rug option. Here are some examples of paintedstair runners that I think look fabulous. I’m sure whatever you decide will look fabulous! Ack. My coding failed miserably. Anyway, the first link is to the recipe and the other two links are to images except that I failed to put the space between them. Geesh. Time to get off the internet and go make dinner. Maybe I can do that successfully. Have you thought about a good commercial grade carpet? Super easy care..pretty kid and pet proof too. Some really great ones out there.